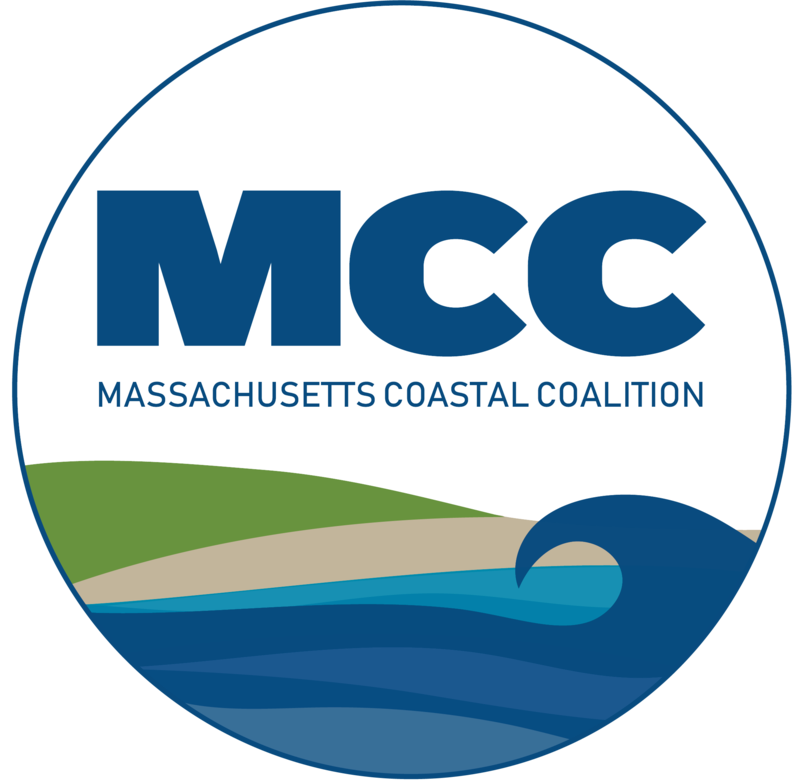 The Massachusetts Coastal Coalition’s Know Flood suite of services brings flood risk information to your fingertips. These services are designed to meet the needs of realtors, lenders, policy holders and residential and commercial applications where flood information can affect everyday life. Note: By clicking on one of our services below, you will be taken away from the MCC website and to a MCC/MassiveCert website. Knowing your flood risk is now as easy as entering an address. The Know Flood Map Service has the entire nation’s digital flood maps online. Simply enter your address in the search bar, and the map pins your building’s location. A box then pops up to introduce you to one of our services. The map search is free and gives you the basic information necessary to assess your flood risk and insurance needs. The service is available on our website's home page. 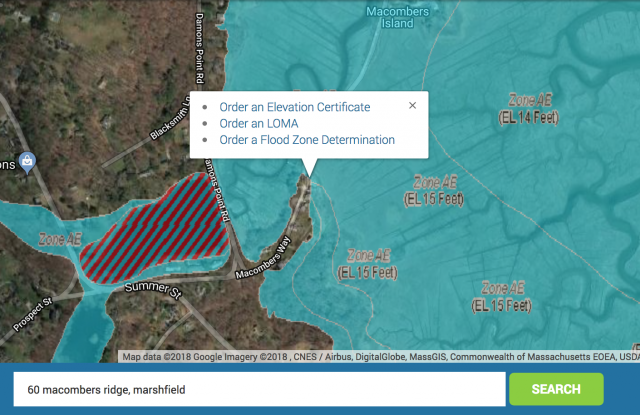 While reading a map can help guide you on what your flood risk is, a flood zone determination is the only official way to know what flood zone you are in. 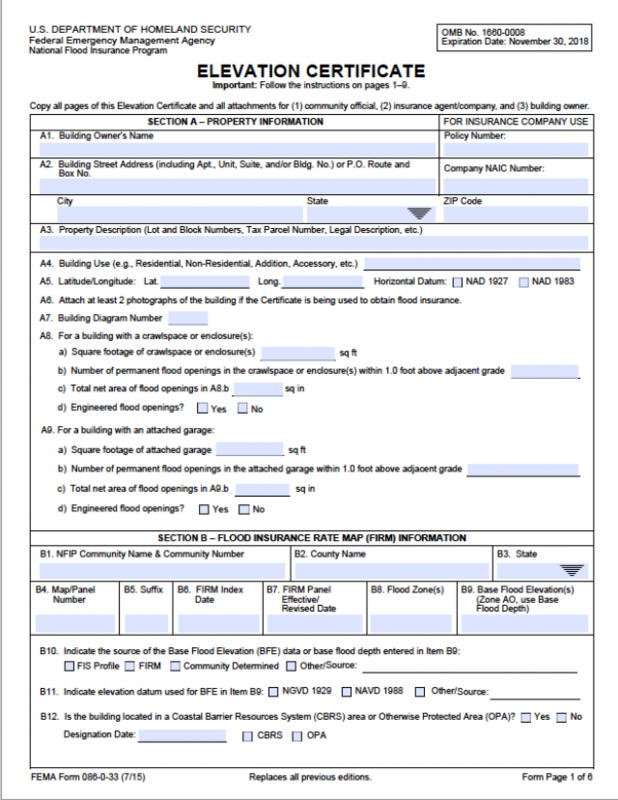 This establishes your requirement to carry flood insurance and your insurance rate. The Know Flood Zone determination is a guaranteed product, which means we guarantee our accuracy. This is the same tool lenders use to decide if you are “in or out” of the high risk flood zone. You will need a determination of your own to challenge a lenders determination! 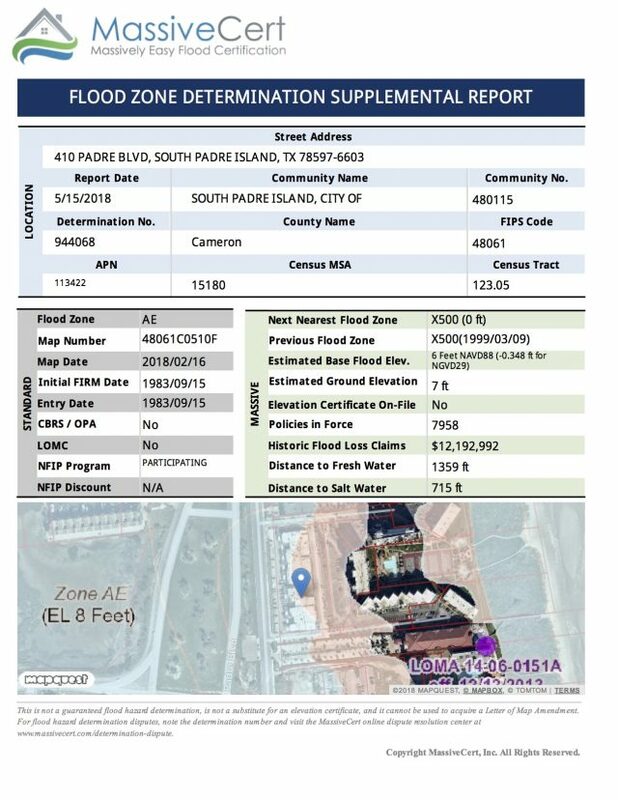 Along with our guaranteed determination comes our “Massive” report, which is one of the most comprehensive flood information reports available. It shows a map of your property, tells you the next closest flood zone, estimated ground elevation and more. All included in the price of the zone determination. This is an ideal tool for real estate professionals looking to inform potential sellers and buyers. With our national network of land surveyors, we can offer standard prices for elevation certificates across the country. You can order and schedule your elevation certificate online and pick from a standard or a rush schedule. Our team of professionals will reach out and book a time to visit your property. We review each elevation certificate for accuracy. If there are issues with the information on the elevation certificate, we work to fix them. 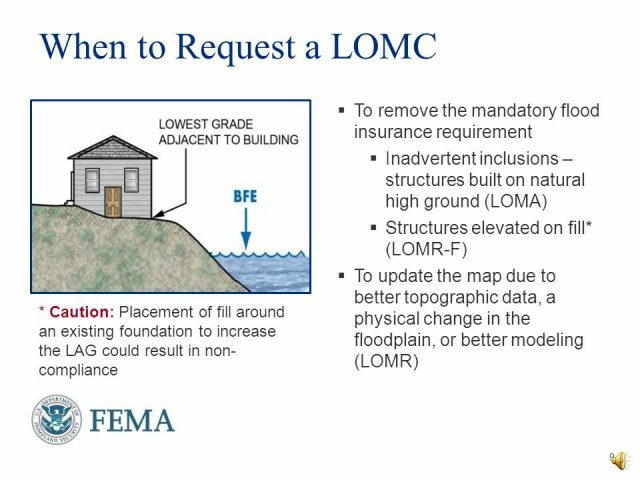 If the lowest grade of your land is above the flood elevation printed on the flood map, your building may be able to be removed from the requirement of having flood insurance. The Letter Of Map Amendment (LOMA) is the easiest way to remove the building from the “A” or “V” zone if it qualifies. The Know Flood Removal is an expedited process and in most cases can be completed in 30 days. To start, you’ll need an elevation certificate. Then we review and verify that you are eligible. If you submit your LOMA request and are denied, there is no cost! Our technical specialists are here to help and guide you along the way. *An individual may visit hazards.fema.gov/femaportal/onlinelomc/signin and apply for a LOMA on their own, free of charge. Our service completes this process for you and is expedited. Have a question about flood insurance? Most of our members do. 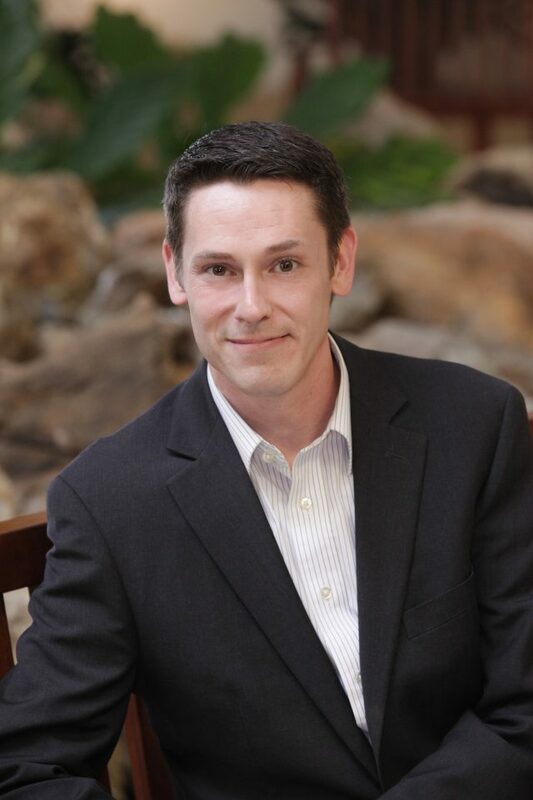 Over the years, the MCC knows the value of understanding flood insurance. We have fielded thousands of inquiries on questions about flood insurance and came to realize there is no single place for stakeholders to get simple, easy answers about flood insurance questions. That’s why the MCC is happy to create our flood insurance service center, run by the MCC flood expert Art McKinney. Art will do his best to answer broad and specific flood insurance questions, or help point you in the right direction. Simply fill out the form below, attach any helpful documents and we will get back to you during our posted hours of operation. A portion of each service purchased is donated directly to the MCC. The MCC is a registered 501c3 charitable organization. All risk services are provided by MassiveCert, Inc. MCC cannot be held liable for any of the information or services provided.